Luanne Calvert is used to working without a net, executing first-class, buzzworthy campaigns and forging relationships on the fly. 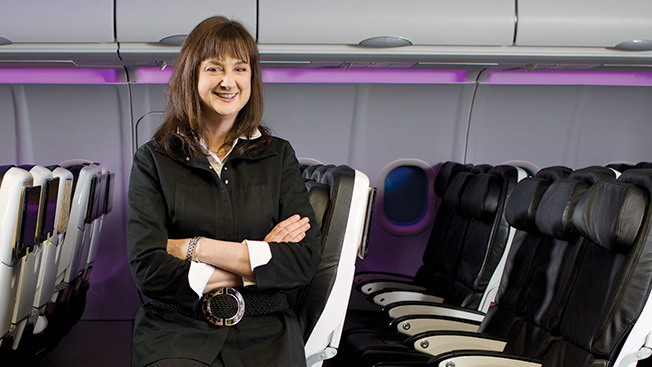 When the five-year-old airline Virgin America, partly owned by Sir Richard Branson’s Virgin Group, hired her in October 2011, it lauded Calvert’s considerable brand and digital marketing experience. (Now Virgin America’s chief marketer, Calvert rose through the ranks of Yahoo, Google and ad agencies such as Goodby, Silverstein & Partners.) What it didn’t mention was her appetite for risk—and attention. “Luanne laughs louder and talks faster than anyone in the room. She throws caution to the wind. She wants to be first to try anything,” says Tom Bedecarre, chairman of the agency AKQA and Calvert’s former boss at Citron Haligman Bedecarre. Calvert’s next challenge: to redefine the business traveler and the best tactics for marketing to them. To do that, she and her team are exploring how today’s always-plugged-in, entrepreneurially defined traveler is evolving beyond the corporate road warrior of the ’90s. Virgin America, based in the San Francisco Bay Area, is experiencing a growth spurt, expanding to 19 cities, with Newark’s Liberty Airport in the wings. The youthful, upscale brand is built on splashy parties, purplish nightclub lighting and close ties to colorful Virgin Group founder Branson. Calvert’s job is to promote the carrier beyond its startup identity, positioning it as an established player featuring discount pricing and a hip, stylish customer experience for travelers no matter whether they want to relax or to work onboard—all with a modest $10 million-$15 million marketing budget, per industry estimates. Calvert and Virgin America have worked with the San Francisco-based boutique agency Eleven since 2008. Together they launched the Experience Virgin America project (experiencevirginamerica.com) in September 2012, its centerpiece an interactive video featuring digital movers and shakers and a sampling of content—sports, concerts, movies, games—offered on Virgin’s onboard channels. Support comes by way of outdoor ads, banners and passengers’ own in-flight photos, which were displayed on a billboard in Times Square in real time last September. By mid-January, the Experience Virgin America site had achieved 300,000 unique visitors and 31 million social media impressions, per Calvert. Here, the marketing boss reflects on lessons learned and what lies ahead. What’s a good example of Virgin America marketing culture in action? A perfect example was the morning last April when I was headed to my office and ended up on a jet full of partying college grads headed for Fort Lauderdale. As a Cyber Monday promotion in 2011, a month after I started this job, Virgin America sold a chartered, round-trip plane ride for $60,000 through a partnership with discount site Gilt.com. The deal sold in about four hours to a group of 148 Stanford University MBA students, who decided to go to Fort Lauderdale for Spring Break. They picked a ’70s theme and showed up at the airport decked out in Afros, bell bottoms and gold lame. It was a hoot. On my way to work, I stopped by the airport to greet them. As they were ready to depart, one passenger canceled, and they talked me into taking his seat. Did that Spring Break flight trigger any marketing insights? Well, we knew from customer feedback and social media that we have lots of loyal fans in Silicon Valley. But it was pretty amazing to see the passion of the Stanford group, who had really planned their whole experience around being on Virgin America. That passion is what we are trying to convey in our Experience Virgin America ad campaign. I also realized how excited people get about traveling. They plan all aspects of their trips and relish the details. Unfortunately, the air travel portion of that journey is usually pretty lackluster. But it doesn’t have to be. That 2011 Gilt charter promotion, by the way, generated 77.4 million impressions. How is your marketing focus going to evolve this year? We are reaching out to today’s business travelers. For us that means entrepreneurial-minded professionals who work at large and small companies, travel a lot and book their flights directly. They are also hybrid travelers who often combine work and pleasure on their trips. So our message is that we give them a choice as they travel. They can be entertained, work, order good food or just recharge. We want to show we are a venue for more than entertainment. What recent marketing programs have come from your willingness to break new ground? What were the results? In August 2012, we started a yearlong contest for a free flight on the Virgin Galactic spaceship [due to start service in December 2013]. The contest promotes the introduction of status tiers to our Elevate loyalty program. You sign up to participate, and the participant with the most Elevate status points by August 2013 gets a free spaceflight. By mid-January, over 20 percent of our Elevate status members had signed up. The effort resulted in over 171 million impressions and $5.66 million in ad equivalency value. Don’t you worry that a marketing gambit-gone-awry could spell disaster? Not really. I tell my team that I support risky creative ideas as long as the idea can’t hurt the brand and it doesn’t cost too much money. First-time, innovative work can cut through the clutter and generate a lot of buzz. Do you ever work with Branson? What did you learn about marketing at a tech company? A lot. It was very different than my agency world. Everything was new; there was no “last year’s plan” to follow. The technology was at the center of the work, not the creative. And there was this culture of collaboration. Everyone got involved in the project, everyone had ideas—ideas from young, entry-level people are as valued as those from senior people. Your reputation is that you’re a creative thinker who depends on intuition and your gut. Are you guilty as charged? Hmm. I’d say I have a sense of curiosity about everything, including the data. I like lots of information, then to squish it and use my gut to decide what to do. I actually like the constraints of data and the constraints of budget. It ups the challenge. I’ve also learned not to be impulsive and try to wing it. Back when I was an agency media exec, I was doing a lot of new business pitches. One time I figured I didn’t need to prepare, I’d just wing it. It was absolutely disastrous. I let everyone down. My boss gave me another chance, which I don’t know if I would do if I was in his shoes. So since then, I’m always prepared. Like a Girl Scout.